Q: What is an power inverter? A: Before you can understand what a power inverter is, it’s important to understand the difference between AC and DC power. In very basic terms, AC power is what you get out of the outlets at your house, and DC power is what you get out of batteries. Since car batteries provide DC voltage, and most consumer electronics work on AC, you need a device known as a power inverter if you want to use AC devices on the road. With a power inverter installed in your vehicle, you can take just about any electronic device from your home or office, plug it into your Inverter, and use it as normal will little to no constraints. The fact is that the electrical system in your car can only put out a limited amount of power, and the battery can only provide so much before it goes dead. Some of the most vital constraints to keep in mind whenever you use an inverter in your car include factors like the capacity of the car battery, rated output of the alternator, and output wattage of the inverter. 110 Volts of current can be lethal. Improper use of a power inverter will result in property damage, personal injury, or loss of life. Please read and follow carefully the instructions in the Owner’s Manual provided with every inverter for important safety considerations and precautions. 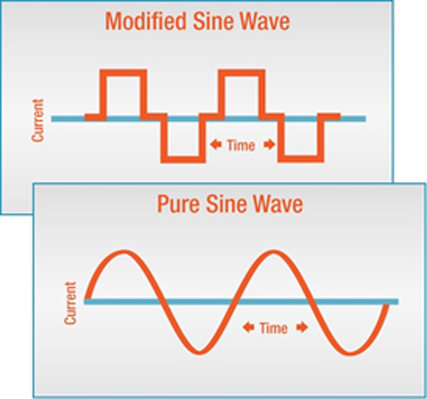 Q: What is the difference between sine wave and modified sine wave? A: There are a number of different types of inverters, but the two main types that you’ll find in automotive applications are: Modified or Puresine wave. Inverters are devices that change the direct current, shortly known as DC, into conventional alternating current or AC. With an inverter, the home-owners can run various devices, including PCs, TVs, lights, kitchen appliances and other kinds of electric energy consumers use. But when people look to buy an inverter powered by AC or another DC source, they often get confused whether to buy a pure sine wave inverter or a modified sinewave. These two types of inverters provide many options. For a clearer idea what’s the difference between the pure and the modified sinewave inverter, here is a quick comparison. Modified Sinewave Inverter – A modified sinewave inverter is named after its output waveform and is a less expensive option than the pure sine wave inverte. When compared with a pure sine wave inverter, the modified sinewave inverter does not require additional components and is a less expensive solution. The only disadvantage of the modified sinewave inverter is that it creates harmonic distortion to audio and inductive equipment. However, a modified sinewave inverter is ideal for heat-element devices and devices with an external adapter. d) Pure sine wave prevents crashes in computers, weird print out, glitches and interference in monitors. A pure sine wave inverter is a more expensive option that comes with better components. The name pure sine wave inverter comes from the wave form of its output, just like the modified sinewave inverter. However, some complicated appliances which are used these days are not suitable for a modified sinewave inverter. This means that a pure sine wave inverters is the safer choice. A pure sine wave inverters is suitable for all applications and all types of appliances. Appliances powered by pure sine wave inverters can have a longer lifetime and work more quietly. They are perfect for household appliances. Because of their sophisticated and complicated design, a pure sine wave inverters is significantly more expensive than a modified sinewave inverters. Q: Can I use a modified sine wave inverter for my medical equipment? A: NO. THOR Manufacturing does not recommend the use of a Modified Sine Wave with any and all medical equipment. Q: How long can I operate my inverter? A: The runtime (i.e., amount of time that the inverter will power connected electronics) depends on the amount of battery power available and the load that it is supporting. In general, as you increase the load (e.g., plug in more equipment) your runtime will decrease. However, you can attach more batteries to extend the runtime. There is no limit to the number of batteries that can be connected. Q: What’s the difference between an inverter and inverter/charger? A: An inverter simply converts DC (battery) power into AC power and then passes it along to connected equipment. An inverter/charger does the same thing, except that it is connected to an AC power source to continuously charge the attached batteries when AC utility power is available. In the case of a power outage, the inverter will automatically switch to battery power to provide power to connected equipment. Q: How fast will my inverter respond to a power outage? Q: Can I use an extension cord with my inverter? A: Yes. While it is recommended that you keep the inverter as close to the batteries as possible, the load can be connected with an extension cord and located up to 200 feet away without signal loss. THOR Manufacturing has two options for extending your inverters reach. Q: How do I connect multiple batteries? A: If you require more than one battery to increase the overall runtime you will need to connect your batteries in Parallel. Q: How do I reset the power inverter? A: The power inverter has overload protection to keep it from being damaged. When the maximum power is exceeded, the inverter will shut off. To reset the inverter, simply press the power inverter button to turn it off, then press it again to turn it back on. Q: What’s the difference between inductive and resistive load? A: A resistive load does not require extra power upon startup, whereas an inductive load experiences an inrush current upon startup and requires more power during the first few seconds/cycles of startup. Q: What’s the difference between startup and continuous load? A: Many appliances and electronics draw a lot more power on startup than they do during continuous use. Because inverters must be able to handle these “peak surge” requirements, the startup power requirement must be considered when sizing your inverter. Q: What is automatic AC transfer switching? A: Our inverter/chargers are equipped with Automatic Transfer Switching (ATS). When AC utility power becomes unavailable (e.g., a blackout),the THOR THIC (Inverter Chargers) automatically switches to DC battery power so that connected electronics stay powered. Q: What is 4-stage charging? A: THOR Inverter/Chargers use a 4-stage charger that recharges your batteries faster, while protecting them against over-charge, over-discharge and accidental depletion. Q: Why do my batteries go dead when I use the inverter/charger in inverter mode? A: In inverter mode, the inverter/charger no longer charges the batteries, but instead depletes their battery power to supply power to connected equipment. Q: Should I leave my inverter on when shore power is available? A: YES, When shore power is available, the inverter/charger conditions AC power before passing it to your equipment and simultaneously charges your user-supplied batteries. When an AC source is not available (during power failures, at remote sites, while driving, when disconnected from shore power or when your generator is turned off), the inverter/charger automatically switche to battery power and your equipment continues to operate without interruption. Q: How do I charge the batteries? A: THOR Inverter/Chargers must be connected to AC utility power for their charging feature to work. This might be a plug-in or hardwire connection, depending on your install. Q: Why is my inverter beeping? A: All THOR power inverters have voltage and short circuit protection alarms and shutdown. This audible alarm indicates there is a voltage problem, a short circuit with the connected appliance, or that the connected battery is nearing approximately 11 volts. Check the battery voltage and make sure it falls in the nominal operating voltage of the inverter. Reference the Product Instruction Manual for these specifications. Q: How do I know what size inverter I need? A: Most 120V AC powered appliances have a rating label on the product or has rating information in the manual. Locate the input specifications for the appliance. These are usually listed in amps. Most power inverters are rated in watts. Approximately 110 watts = 1 amp. (i.e. if you have an appliance with an input current of 1.5 amps you would need at least 165 watts.) We recommend a larger model than you think you’ll need (at least 10% to 20% more than your largest load). Q: What can my inverter power using the DC accessory plug through my vehicle’s accessory outlet (cig lighter)? A: All THOR power inverters 400 watts and under come with both an accessory outlet (cig lighter) input cable as well as battery clips. The reason for this is due to the limitations of a vehicle’s accessory plug outlet, a typical vehicle accessory outlet can only safely produce about 100 AC watts. The DC accessory plug in your vehicles provides enough output for our inverters to run small appliances such as personal computers, cell phones, portable DVD players and other smaller electronics. Q: Can I connect my large power inverter to a vehicle accessory outlet plug? A: NO. THOR does not recommend the use of any inverter larger than 400 watts to be used on your vehicles accessory outlet. The reason for this is due to the limitations of a vehicle’s accessory plug outlet, a typical vehicle accessory outlet can only safely produce about 100 AC watts. The DC accessory plug in your vehicles provides enough output for our inverters to run small appliances such as personal computers, cell phones, portable DVD players and other smaller electronics. Q: How do I know if I need a sine wave, or if I can live with a modified sine wave? A: The following gadgets work well with a modified sine wave: computers, motor-driven appliances, toasters, coffee makers, most stereos, ink jet printers, refrigerators, TVs, VCRs, many microwave ovens, etc. Appliances that are known to have problems with the modified sine wave are some digital clocks, some battery chargers, most light dimmers, some chargers for hand tools (Makita is known to have this problem in the past). In the case of hand tools, the problem chargers usually have a warning label stating that dangerous voltages are present at the battery terminals when charging. We would like to add to this FAQ any appliances that you have had trouble with, or had success with, using modified sine wave inverters. Please email us at the THOR support tab located at the top of these webpage. Q: Why do I hear buzzing on my stereo when using a modified sine wave inverter? A: Some inexpensive stereos use power supplies that cannot eliminate common-mode noise. These would require a pure sine wave inverter to operate noise-free. Q: Why don’t I measure rated voltages when using a multimeter on my modified sine wave inverter? A. The rated voltage is an RMS (root mean square–they square the value to make sure it is always positive, then average it, then take the square root of the average to make up for having squared it in the first place) measurement. Most multimeters are designed to give correct RMS readings when applied to sine waves, but not when they are applied to other waveforms. They will read from 2% to 20% low in voltage. Look for a voltmeter that states “True RMS” readings, and that will read correctly no matter what the wave form is. Q: How is a microwave rated for wattage? A: When you buy a microwave oven you want to know how intense the microwave field is, not how much the oven draws from the wall. So a microwave oven that boasts 600 watts on the box, will have an input requirement of 1200 watts on the boilerplate in the back. Don’t be fooled! Q: Why do I need such humongous cables to the battery when a small cord takes the AC output fine? A: Power is volts times amps (Watts = V x A). So if you have a lot of voltage you don’t need many amps to get a watt. Roughly you need 12 times as much current from the 12 volt battery as you need from the 110 volt AC outlet. Current is what causes cables to heat up, not voltage. That is why they use thousands of volts in long distance power transmission grids. The thing to do when you have lots of current is to lower the resistance of the cable. The larger the wire the lower the resistance. Think of the cable as a water pipe. A big pipe (wire) can carry more water (current or amperage) with less pressure (voltage), and will present less pressure (voltage) drop from one end of the pipe to the other. Another consideration is how far the cable has to run from the battery to the inverter. Long cable runs are expensive, either in copper or efficiency, or both.